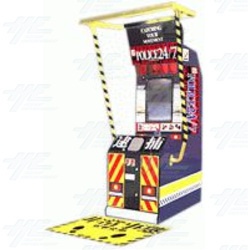 Police 24/7 was one of the first games to incorporate motion sensor technology into a upright cabinet. Various sensors on the machine allow for a more interactive game. The player needs to move and dodge their actual body as part of the game. At its root Polcie 24/7 is still a light gun shooting game, but with the addition of motion sensing technology it allows the player to become more involved in the action. Police 24/7 is also called Police 911. At its root Polcie 24/7 is still a light gun shooting game, but with the addition of motion sensing technology it allows the player to become more involved in the action. Police 24/7 is also called Police 911.